Ever had a day in London where you try to pack too much in? You choose attractions which are in different locations then spend your whole time negotiating the city’s underground system, popping up to see something before descending back down into the bowels of the earth via the Piccadilly Line escalators. On a recent trip to the capital, when we stayed at the Mondrian Hotel, Sea Containers, we decided to focus on the south side of the river and it proved to be a great success. The main advantage for me is the lack of traffic. I am the world’s worst road-crosser and in London I am a slave to the lights and the Look Left/Right signs painted on the tarmac. On the south bank, along the river, it’s pedestrianised, making it a real pleasure to just amble. It’s perfect for families too as its much safer and the air probably less polluted. If you arrive at lunchtime, head for London Bridge, using The Shard as a visual guide, and make your starting point Borough Market, where you can choose from dozens of delicious food outlets. We picked a fantastic Malaysian chicken curry which we ate sitting on a wall in the sunshine outside Southwark Cathedral. Heading west you can visit a reconstruction of Francis Drake’s Golden Hinde II, the Clink Prison Museum or be tempted by a wine-tasting at Vinopolis. If art is your thing, the Tate Modern is always worth a gander. Passing Blackfriars Bridge you can’t miss the Oxo Tower and nearby, the delightful Gabriel’s Wharf, an area of small independent shops and cafes which look as if they’ve been scooped up, en masse, from some small provincial town: hard to believe this is in the centre of one of the world’s busiest capital cities. Did you know there is a little beach here too? Only recently named Ernie’s Beach, after a local resident and activist, John Hearn MBE (known as Ernie) who has spent many years campaigning against the reclamation of the foreshore. He joined the Coin Street Action Group in the 1970s, fighting for affordable housing and open spaces. Ernie and the group succeeded in persuading the authorities to save the existing river wall and beach. A plaque was recently erected to highlight Ernie’s dedication to this part of London. If you start to flag, there are plenty of benches to rest weary legs. Look out across the river and see the cruisers ploughing up and down or admire the Dazzle Ship, Tobias Rehberger’s bold transformation of HMS President, moored on the north bank of the Thames. Dazzle camouflage was first used in the First World War, making it difficult for the enemy to target a ship. The idea was not to hide the ship but paint them so they were optically distorted. A submarine would have difficulty calculating the course a ship was travelling on or know from what angle to attack. HMS President was originally ‘dazzled’ like this: contrasting curves and stripes, breaking up its shape and outline. HMS President – the dazzle ship. There are gardens everywhere, from the Jubilee Gardens near County Hall to the hidden roof garden of the Queen Elizabeth Hall. There’s a massive sand pit for children and probably the oldest skate park in the world under the South Bank Centre. Everywhere you look there are pop-up bars, cafes and street entertainers. It can get busy but never feels crowded. To rival the offerings in the West End, there’s the National Theatre and Shakespeare’s Globe Theatre. Spend an evening at either of these or make the most of darkness descending by taking an evening trip on the London Eye where the whole glittering, sparkling capital will be laid out before you. We spent one evening at the National Theatre, seeing George Farquhar’s comedy, The Beaux’ Stratagem. It’s ages since we’ve been to the National to see a play but it has made us both realise how fantastic this theatre is, not least for its number of loos. I know this shouldn’t really be a consideration when choosing to see a production in London but, having queued endlessly for the ridiculously small number of toilets in most West End theatres, it really was a joy to have an abundance of cubicles, on each floor. This is also worth remembering if you are sightseeing on the South Bank during the day: if you are caught short there are plenty of facilities in the National and other public venues such as the Tate Modern. You can easily spend a whole weekend on the south bank and never need public transport until it’s time to head home. It’s such a relaxed way to enjoy London and one we will definitely try again as we still only scratched the surface this time round. We usually stay in Southwark when we stay in London and enjoy how walkable everything is. Lovely to hear you're a fan of this part of London. It really is enjoyable, isn't it. Yes, Cog and I walk up and down there a lot. Easy, like Sunday morning. I've had some great ideas from reading your London posts over the years. Easy like Sunday morning sums up this part of the capital perfectly. My 'to do when next in London' pile is getting pretty unmanageable these days. We'd better go soon! I find I do this too – read things and say, 'ooh must remember that'. I don't know how you fit in all your must-sees' now you're in the UK. Yes, the Festival Hall too – so many places to visit. That's an idea – the Christmas market! Thanks for the tip. I remember when I lived in London I travelled everywhere by Tube – what a daft thing to do, I missed so much. I took my mum to London 2 weeks ago to this very spot. We stopped at the London eye and got a river cruise down to London Bridge, we learned so much and saw all the main attractions, it was amazing how many amazing things are packed into this tiny area of London, and seeing them up close was mesmerising. 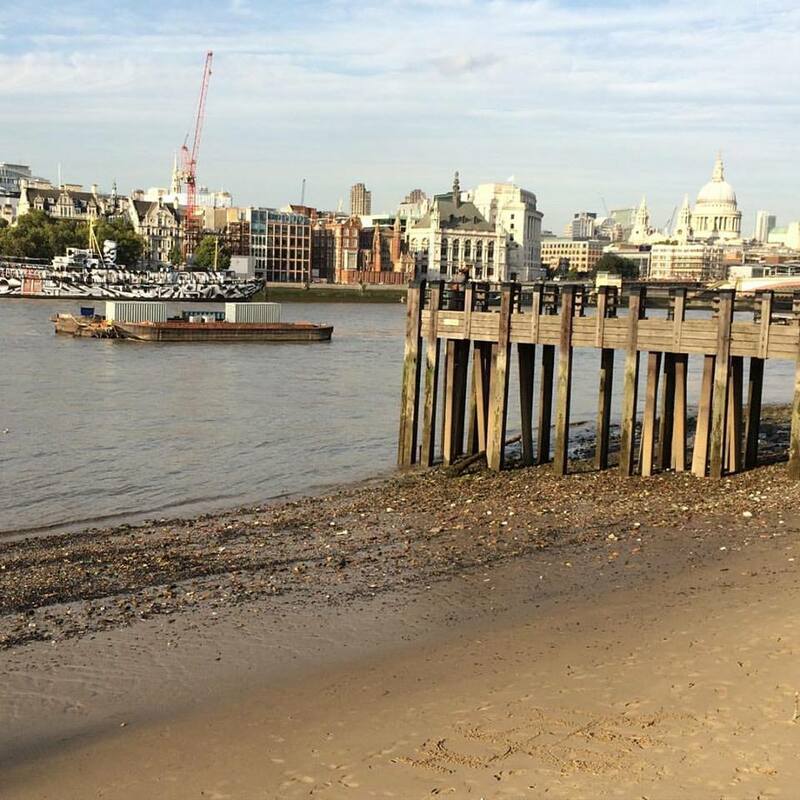 I love your tip about the beach – had no idea there was a beach in London! That's what makes the area so special – it really is packed with some fabulous attractions. Yes, you'll have to hunt out the beach next time. It does seem to have an air of festivity about it, you're right. Something exciting day and night, summer and winter. It's a pity it's taken me so long to realise this! All those years walking and tubing it all weekend. Looks like we are all guilty of this at times! Yes – perfect for families! The cocktails are fabulous, aren't they! We have often stayed in hotels on the South Bank and walked to the West End – it's not far at all. We did the London Dungeon a few years ago too – blummin scary! Have you read my review of the Mondrian? We loved it. The lobby with the hull design is superb.